If you have more than one web browser (like Internet Explorer, Firefox, Opera) installed on the computer – this can confuse Windows and you need to specify the default web browser. Ideally you can set default web browser by going to browser settings and options. If Firefox is set asÂ default web browser any attempt to open an HTML file will open it in Firefox. Unless you manually open any other web browser and open that file. There are times when you need to swtich your default web browser, small utlity ‘Browser TraySwitch’ gets more than handy in such cases. 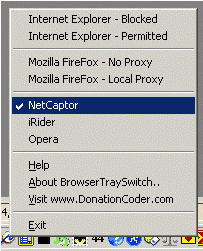 It sits on system tray, you can right click to selected default web browser. Double click on the icon to open the selected default web browser window. As pointed by the creator of the utility, swtiching web browser can be good security measure. You can block your commonly used browser from internet and prevent installation of any mallicious code. This may not much for many, still worth a use if you switch default browser regularly – Browser TraySwitch.